At Roseberry our vision is summed up through the above mission statement. We believe that our children should not be defined by their socio-economic circumstances, ethnicity or gender status. We expect them to achieve the very best that they are capable of in readiness for their future lives. Our vision for Roseberry is underpinned by a set of values, which like pieces in a puzzle, join together to shape well-rounded, responsible and ambitious individuals. 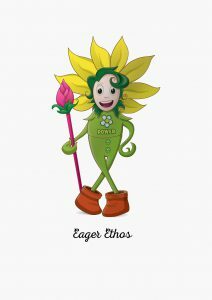 When Eager Ethos first started at Roseberry he was a tiny seedling. Through careful nourishment and a calm, safe environment he has blossomed into a beautiful, healthy bloom. His big ears and bright eyes represent how he was listened to and looked out for while also being guided to look out for and listen to others. He has learned that his actions, words and choices can have an impact on those around him but also help to keep him safe in and out of school. Standing tall with a sense of pride, he is strong and is rooted even in stormy weathers. His big smile welcomes all, celebrating our individuality. 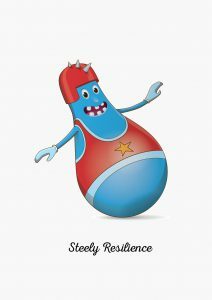 At Roseberry, just like Steely, even though we encounter struggles and difficulties or have obstacles put in our way, we don’t give up. With the support and encouragement of everyone at Roseberry, we keep on trying to be the best that we can be. Steely loves to celebrate his and others’ successes and recognises that by persevering, success in all areas of school and life can be achieved. He knows that success breeds success and at Roseberry, we like to fly high. 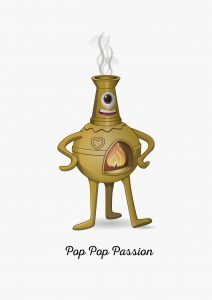 Pop Pop represents the core values of passion and emotion. Pop Pop recognises that everyone’s passions are different and that everyone needs something to feed their soul. At Roseberry, we are popping with passion! Enthusiasm for life beats through our hearts. This helps us to become confident, motivated and aspirational individuals. All members of the Roseberry family are encouraged to build positive relationships based on mutual trust and respect to enable them to successfully express themselves in their own unique way. Annie and Arnie are part of the Aspiration Army. They always work super hard because they know the skills they learn in school will help them achieve the unimaginable in life. 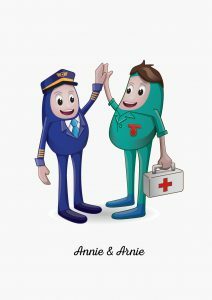 Annie has always dreamed of flying high, so one day, she hopes to become a pilot. Arnie likes helping people and is very kind and caring, so one day, hopes to become a nurse. Annie and Arnie always encourage others to stride ahead, break down boundaries and reach up high. At Roseberry, to achieve our dreams just like Annie and Arnie want to, we must be continually marching forward towards our own unique goals. Artie Creative reflects the diversity of Roseberry. 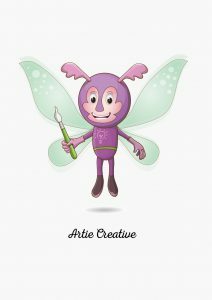 Artie Creative’s wings were once firmly stuck to her side until Roseberry Primary School encouraged her to think outside the box and spread her wings. The super supportive environment has given Artie Creative the strength to take off and soar into the clouds, expressing her individuality as well as inventing new ideas across the curriculum and beyond. From mathematics to musicality, from local to global, she quickly learned that you don’t need to be the best – you just need to be yourself. Teamwork Tango is all about teamwork. Teamwork Tango knows that when we all pull together, dreams can be achieved in school and beyond. Teamwork Tango knows that there is no “I” in team and that when we work together, we can achieve so much more. He is very confident and determined to be a success as an individual but also as part of a team. He enjoys taking part and challenging himself and challenging others whilst valuing the achievements of all. With his many arms, Tango is strong and adaptable and prepared to give his best in everything he does.